George and Amal Clooney are all but confirmed to be among the godparents of Prince Harry and Meghan’s first-born child, DailyMail.com can reveal. A source close to both famous couples told DailyMail.com: ‘Amal and Meghan have been close for years, and Harry and George have become buddies because of that. 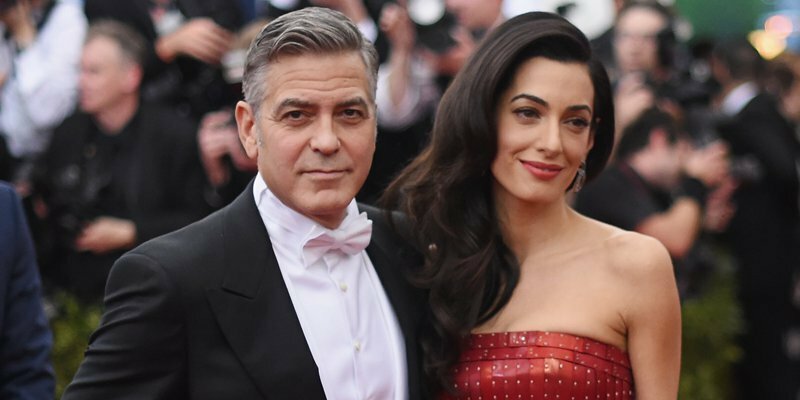 The insider adds that George has ‘told a couple of people he has a strong hunch’ that they’ll be among the couples asked to form such an important role in their little one’s life. In a testament to their strong ties, Harry and Meghan are expected to attend a dinner party next month at George and Amal’s London home, with Barack and Michelle Obama on the star-studded guest list. But it’s not just George’s Hollywood connections that have him on Harry’s radar as a godparent – in fact, his cousin Ben confirms it’s all about Amal, who Meghan considers an incredible role model. DailyMail.com can also reveal Amal and George are spending more time in his hometown – where his parents Nick and Nina still reside. Ben added: ‘I’m not in on those royal circle talks, but that’s not to say next time he comes in we might sit down for an hour over bourbon and talk about it. And the couple certainly wouldn’t be expecting any royal treatment, with Ben predicting that George would show Harry an American, country-style good time as he plays tour guide in Kentucky. He says George would likely take Harry to his favorite hang-out, The Augusta Irish Pub, where there’s a life-sized cardboard cutout of the town’s most famous export. ‘They’d have to go and get a picture with that,’ says Ben. ‘[There’s the] basketball court that he loves in Augusta, and maybe the pool, his nieces and nephews loved the pool.